A General Dynamics subsidiary plans to employ an additional 2,200 workers in 2018 to support submarine engineering, design, operations and fabrication work in Groton, Connecticut, and Quonset Point, Rhode Island, The Day reported Monday. Jeffrey Geiger, president of General Dynamics Electric Boat, told state and local officials in Groton Monday that the company hired at least 3,000 employees in 2017, bringing the subsidiary’s total workforce to 16,200. Eleven of the 13 Virginia-class attack submarines that are under contract with the U.S. Navy are in the construction phase, according to the report. Electric Boat expects to build 55 additional submarines for the service branch in the next two decades. 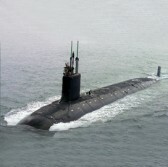 The Navy plans to buy 12 Columbia-class ballistic missile submarines to replace its current fleet and Geiger said the company expects design work on the vessel to be at least 80 percent complete before the full-scale manufacturing phase begins in late 2020. “What we’re seeing is increased support, increased demand, and the Navy’s planning on increases to keep the procurement rate at two per year,” Geiger said of the attack submarines. The report noted that Electric Boat spent at least $40 million on simulated mock-ups and other employee training initiatives in 2017.